When I first left Charleston and returned to Michigan, I thought a lot about getting a tatoo. I don;t have any tatoos. It’s something I have thought about off and on for years but there have been a few mitigating factors holding me back: could I stomach the pain of a giant needle cutting beneath my skin? Was there any piece of art or words I was willing to attach to my skin, possibly forever? Is there any tatoo…er I could trust either artistically or hygenically? So…what exactly is the STBX ashamed of? The Boy? His father (i.e. me)? Her failed marriage? Her part in the destruction of The Boy’s family? Herself? It doesn’t really matter. This tattoo is not unlike a vanity license plate on a car that contains such an obscure or deeply personal reference that it has to be explained to strangers and is thereby ultimately self-defeating of it’s purpose to begin with. This I know: this is the most publicly outspoken the STBX has been about anything pertaining to out divorce. She’s managed to mask just how much this whole thing has affected her…until now. 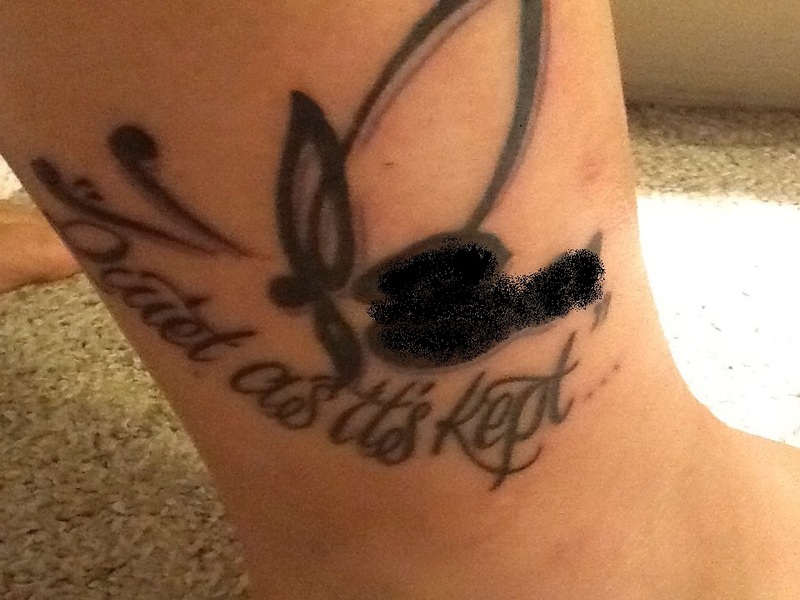 And now she has to wear that fugly ink on her cankle FOR THE REST OF HER LIFE. In hindsight, I’m just glad I never decided to put a tattoo gun to my skin now. This whole thing would be pathetic, if it wasn’t so funny.